Darien's Leslie Yuen controls the ball during the girls soccer game against Trumbull at Trumbull on Tuesday, Sept. 13, 2011. TRUMBULL -- In the first game of the regular season for both teams, the Darien Blue Wave and Trumbull Eagles played to a 1-1 tie Tuesday night at Trumbull High School. The Blue Wave and Eagles each tallied a goal in the first half, but neither could capitalize on multiple second half scoring opportunities to break the deadlock. "I thought we played pretty well. It was a slow start, but once we got into it I thought we possessed the ball well," Darien's Leslie Yuen said. "There were times when we were a little sloppy, but we worked hard." 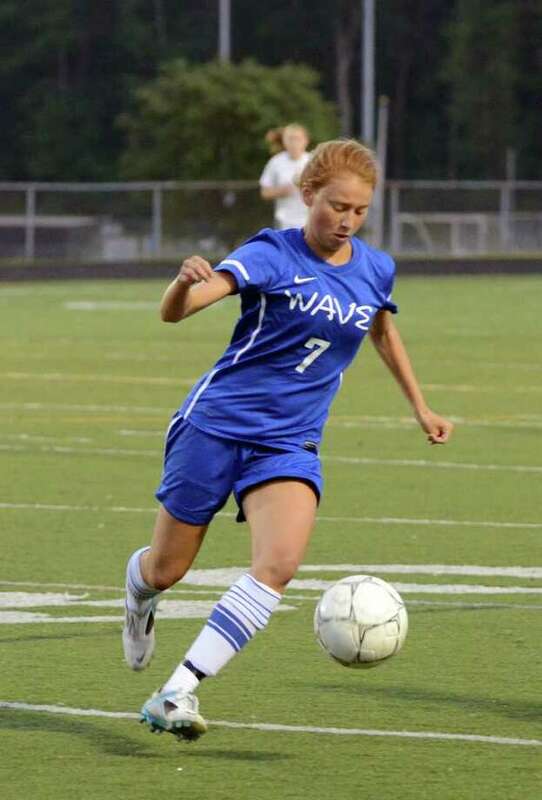 After taking in a pass from teammate Dillon Schoen, Marieke Bravo scored the Blue Wave's first goal of the 2011 season just over eight minutes into the contest. Bravo blasted a high shot, and Trumbull goalie Alanna Lynch jumped high to get both hands on the ball, but the force of the shot was enough to cause the ball to deflect into the back of the net. "The ball just kind of came out around the 18-yard line and I just took it as a chance," Bravo said. "Luckily, it was a good hard shot so it bounced off the goalie's hands into the net. I don't mind who gets [the first goal of the season] as long as we get the goal." After the opening 20 minutes or so, the speed of the game picked up noticeably, as both squads appeared to settle into their game plan and adjust to the intensity of a regular season FCIAC matchup. "You're always a little bit nervous for the first game. From my point of view, there were a lot more positives than negatives with the way our girls played," Darien coach Leigh Parsons said. With Trumbull still trailing 1-0 and less than a minute remaining in the first half, the Eagles were awarded a free kick after a foul was accessed to Darien. Trumbull's Riana Odin took the free kick from the 35-yard line, and blasted a high shot toward the Darien net. Though Odin's shot came from a great distance, there was little that Darien netminder Phoebe Taylor could do about it. Odin's shot sailed just underneath the crossbar and into the back of the net, despite a leaping try by Taylor, as the Eagles tied the game at 1-1 with just 18 seconds remaining in the first half. Parsons expressed some disappointment in allowing a game-tying goal so close to halftime. "It was one of those goals that happens sometimes. It was a long free kick, so they wanted to get it in the box and see what happens," Parsons said. "To get a goal scored on you right before halftime is never a good thing. It would have been easy for our girls to put their heads down and think that it's over, but I think we really came out in the second half and showed what we're made of. We created plenty of chances in the second half." Although Darien would certainly have preferred to start the season with a win, the Blue Wave took some consolation in knowing that they tied a very talented team in enemy territory. "I think we did fine. They're obviously a very good team, so we'll take the tie and move on," Bravo said. "I think it's good for us. A tie is not a loss so we'll take the points. Obviously, we want to win, but we'll work up to it."